After reading this answer about the RTGs used on the Lunar surface, I added some of the images from the Wikipdia article Apollo Lunar Surface Experiments Package into this answer, where I noted that the Lunar soil at that location was pretty dark by comparing it to the darkness of the radiator fins of the RTG. Then I looked up and noticed that the whole side of the LEM appears to have the texture of crinkled metallized film, but it's extremely dark! Is this a result of the landing, or was it supposed to be like that? I thought the purpose of the metallization was to reflect the sunlight to avoid the more than 1 kilowatt of light per square meter from overheating the spacecraft and crew. Did this darkening cause trouble? I don't recall seeing LEMs so dirty - assuming this is lunar soil, was this darkening site-specific? 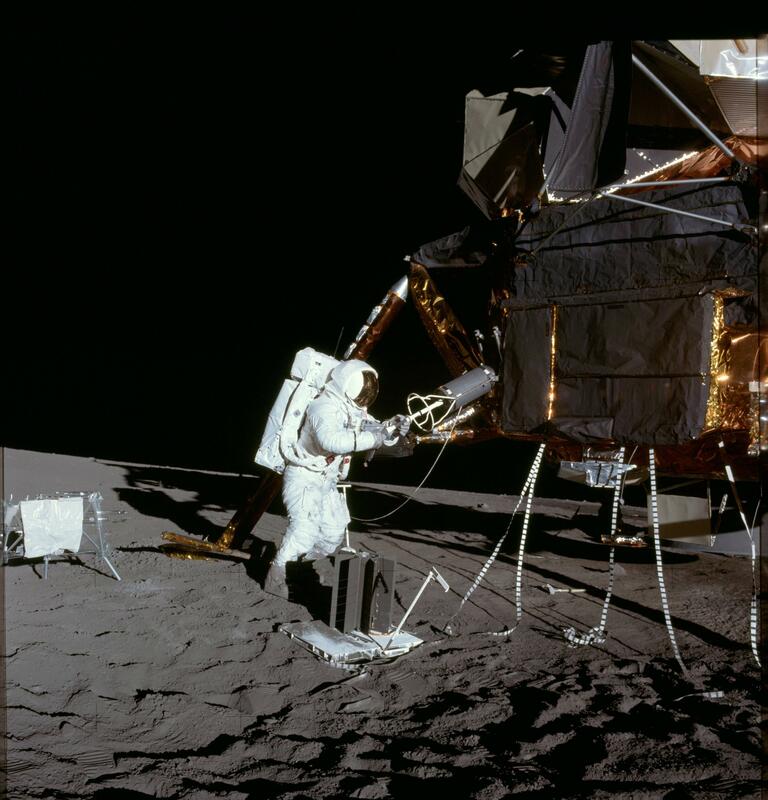 above: Cropped and annotated details from: "Astronaut Alan L. Bean from Apollo 12, put the Plutonium 238Pu Fuel from the Lunar Module into the SNAP 27 RTG" from here. 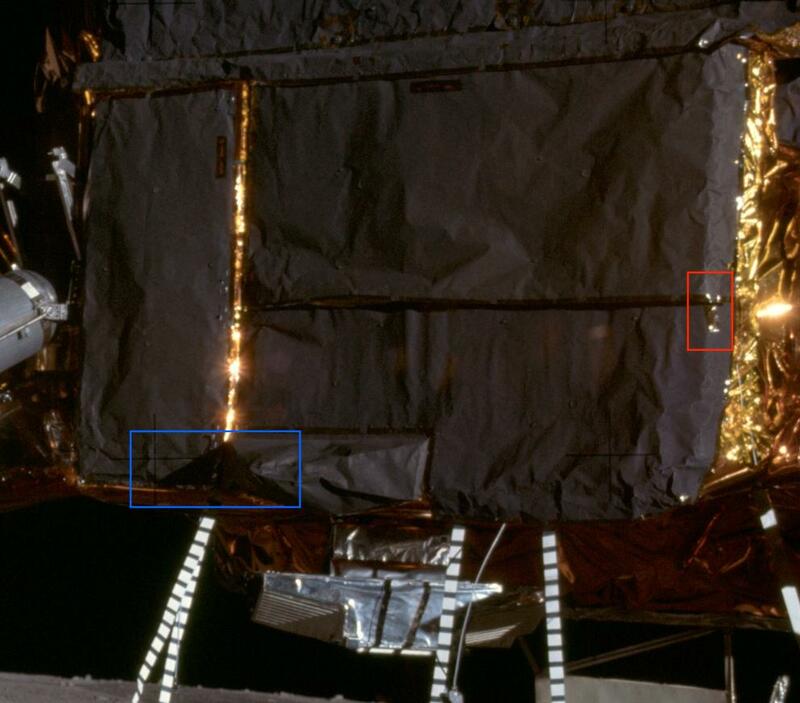 note: red rectangle highlights possible missing "black stuff", blue rectangle highlights a shadow from a sunlit part of the "black stuff." other blue arrows show shadows cast from sunlit rods. Small blue arrows show a dark surface with bright gold circular areas suggesting a pattern of screws or fasteners perhaps. 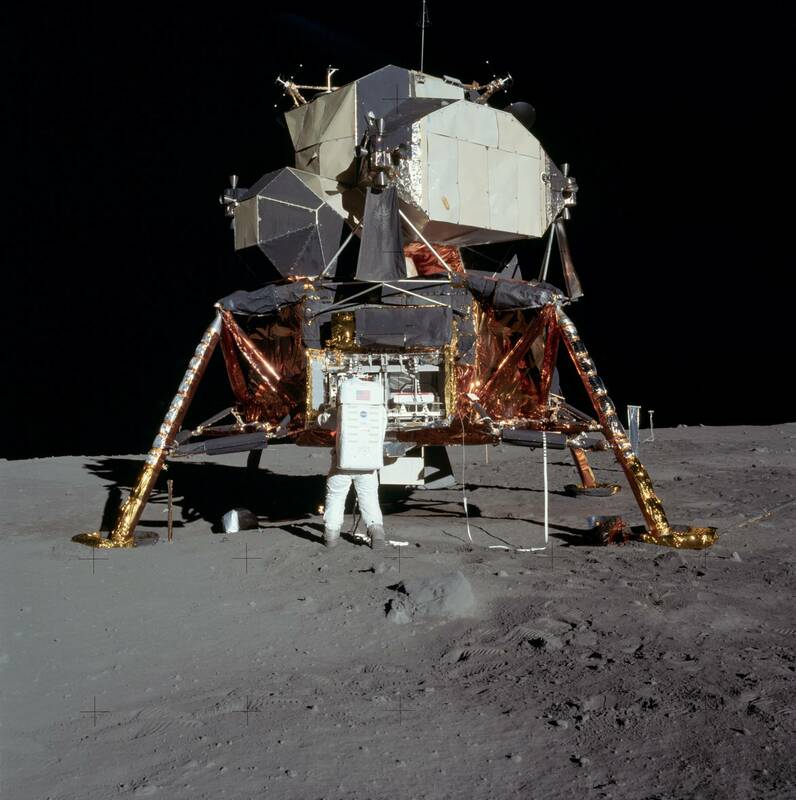 above: Apollo 11 NASA image 1969-059C appears to be the same side of the LEM, although a different mission. The "dark stuff" is there but surrounded by bright film on either side. 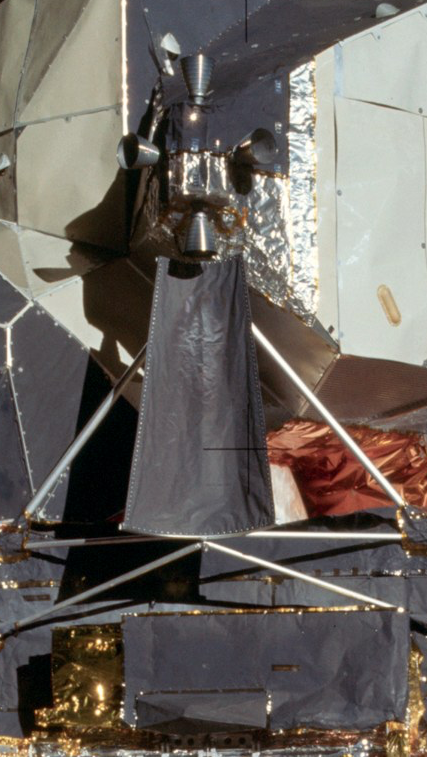 Because the top deck and side panels of the descent stage are subjected to engine exhaust, these areas are extensively protected with a nickel inconel mesh sandwich outboard of the mylar and H-film blankets. Essentially, when light is absorbed, a photon of light comes in and hits an electron, giving it some energy. Now whether it’s absorbed or not will depend on the structure of the electrons [in the atom]. If there's somewhere for the electron to go, and if it can increase it's energy level, then it will absorb the light. If not, then the light can't be absorbed and carries straight on. If it is absorbed, the substance looks black. If it isn't, it’s white [because the light is reflected back]. This means that, if you heat something up, if there's [a higher energy level] somewhere for the electrons to go up to, and it’s black, then there's also somewhere for the electron to drop down to again, meaning that the substance will also emit energy. So if something is good at absorbing light then it’s also good at emitting it. So a black thing should be much better emitting light than a white thing. The Lunar Module Coatings Page has diagrams showing where all the different kinds of insulation and coatings were used on the lunar landers. Not the answer you're looking for? Browse other questions tagged apollo-program materials lunar-landing thermal thermal-control or ask your own question.